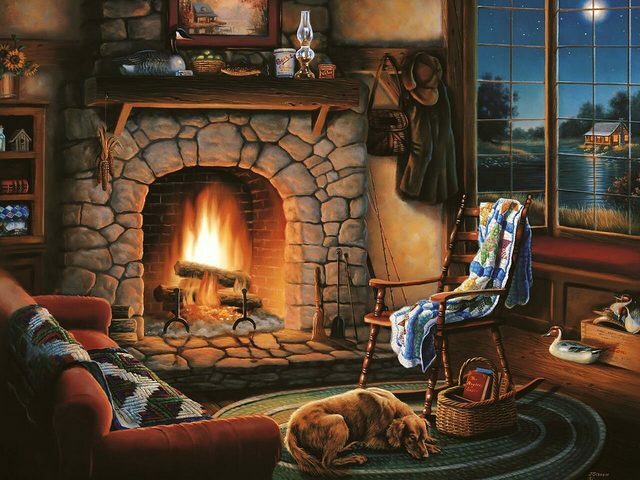 The painting 'Cozy Cabin', which depicts a beautiful scene with sleepy dog in front of a burning fireplace, is an artwork by the talented artist Judy Gibson. Born in Paris, Texas in 1946, Judy Gibson is one of the most sought-after and most recognized artists not only in Texas but throughout the world. Her art themes are diverse, from local scenes of Texas to exquisitely detailed paintings of wildlife, painted with oils, watercolors and colored pencils. Her love for animals is the driving force in her artworks.